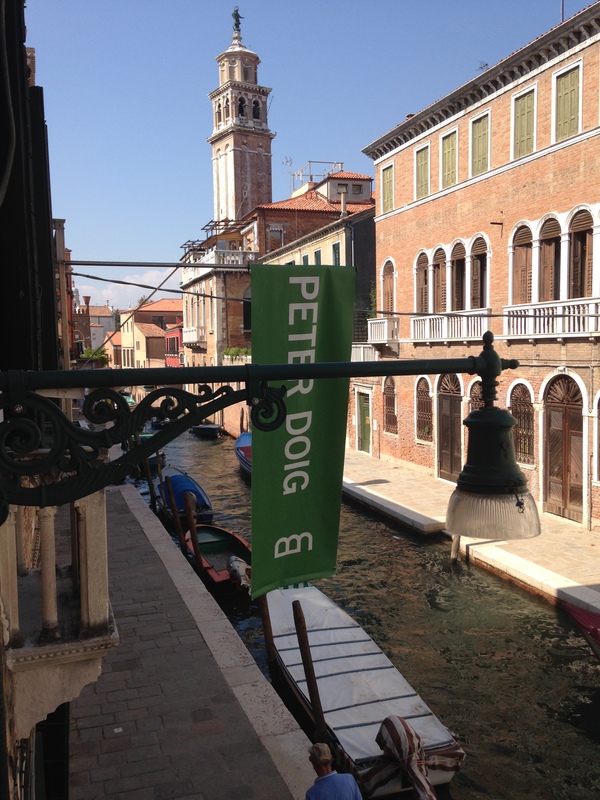 Off for a few days…and now returned…from the Venice Biennale – here’s my thoughts. 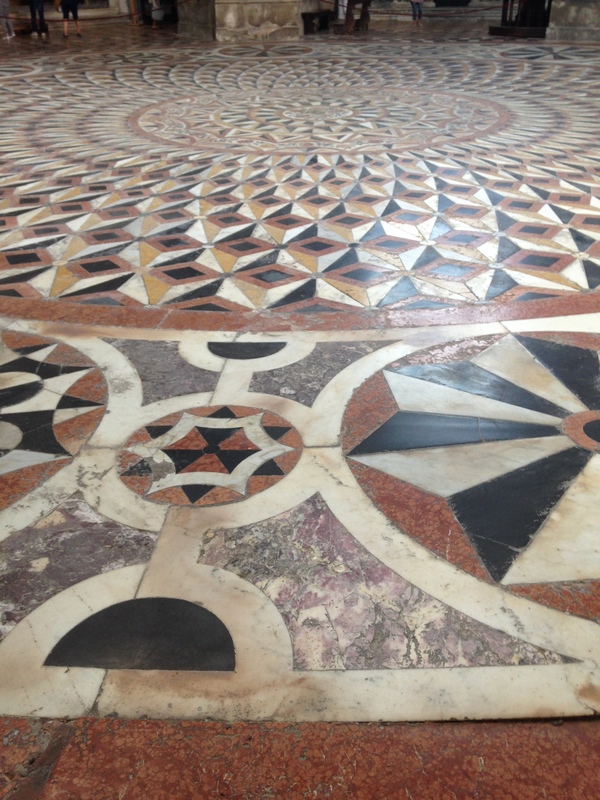 Coming to the biennale is like putting on an old pair of shoes. They are really comfortable and fit snugly but you can’t help feeling you’d like to try something new that might put a spring in your step. We started in the Giardini at just after 10:30 & habitually began by trekking up the long avenue towards the very grand British pavilion by way of the Switz, Venezuelan, Russian, Japanese, Korean, German, & Canadian offerings. Thinking back this is the way we always do it & perhaps we should turn about in future – polish off Spain, Belgium & the Netherlands and head straight into the Italian pavilion with the multi national curated section. Where, not constrained by national considerations in the mix, a more eclectic offering results and the options are more intriguing. As it was by16:45 ones critical faculties are pretty stunted making appraisals of – say – McArthur Binnion or reappraisals of – say – John Latham difficult if not impossible. Finnish art was aided and abetted by someone with Doncaster sensibilities with predictably whacky results. Whackism was generally big this year with Finland coming in ahead of Iceland and Hong Kong in Venice slipping in somewhere behind them. My old pal John Rimmer’s Nutglove would have given them all a run for their money. Of course the Korean pavilion was also whacky but that’s par for the course. Mark Bradford put on a class act for the US whilst the U.K went big and rather overblown and the French cool & classy. The Low Countries & the other Scandinavians just didn’t seem to have their hearts in it. And the Germans lost their way in sub- performance activity that was frankly a bit silly (and was rather surprising given that the ‘action’ takes place in a glass box beneath the feet of the audience). I enjoyed Russia (part 1) and Erwin Wurm was suitably entertaining for Austria with his ongoing series of One Minute Sculptures though I was sorry for t’other rep for them – Brigitte Kowanz – as her quite serious contribution to light art suffered as a result. On the rest of the back lot things were solid but a bit dull. Though I enjoyed Geta Bratescu’s (now 91 years young) survey show of sixty plus years of artistic endeavour (in the Romanian pavilion) – that very controversially – comprised painting and drawing. Actually age was a theme running through a deal of the contributions in the national pavilions and even more so in Christine Macel’s curated section. I lost count of septuagenarians and octogenarians being given a run out. This started with works by UK artist Rasheed Araeen (82) a piece he originally conceived back in 1968. 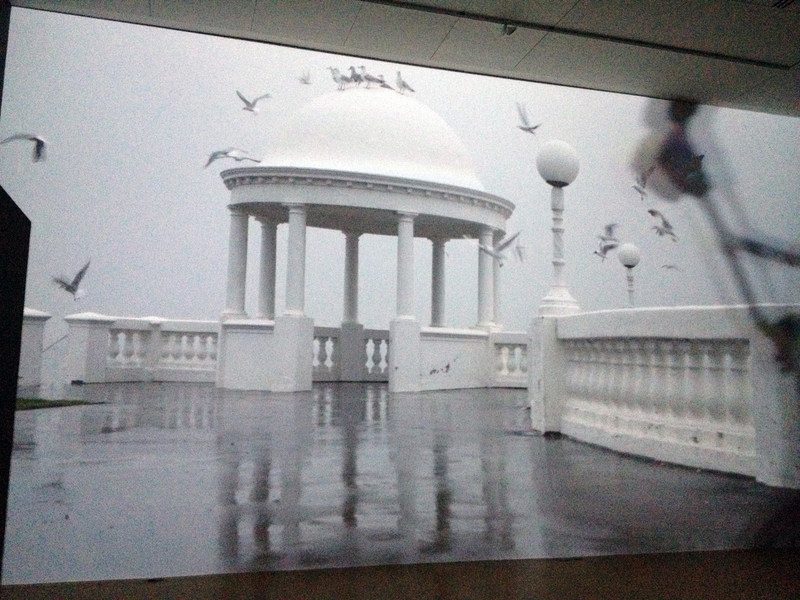 In the same space Juan Downey (born 1930 and sadly died 1994) showed an excerpt from a video work of the 1970’s. It was good to see Raymond Hains’ work being given enough room to spread out and the curator able to expand my understanding of an artist that certainly to UK audiences is little known. That the work included pieces directly related to the Biennales of the past was a valuable addition to the show. It was lovely to have some genuine quality in drawing from Kiki Smith, though to be honest her room didn’t have (at least to me in this context) quite the intensity of magical charm I’d usually expect. 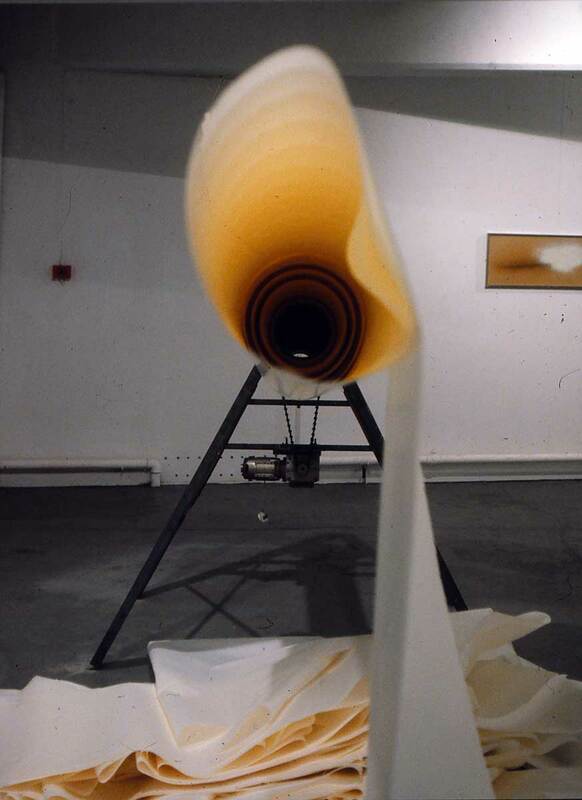 The UK artist John Latham (1921 – 2006) was accorded a ‘mini-retrospective’ too whilst David Medalla (aged 79) showed a piece involving embroidery that he first gave an outing in 1971. Embroidery was a thread (apologies) running through a great deal of the show, especially in the Arsenale. Though carpets were in shorter supply than a few years back when they swept through a wave of major shows a few hadn’t got the memo that it was now a lighter touch on these materials that was required (to be fair to Petrit Halilaj a Kosovan refugee and one of the youngest exhibitors at 31 his pieces are performative works that inevitably lacked some of their poetry in this context). Someone who had was Lee Mingwei, a Taiwanese artist (though like many of those chosen by Macel, now resident in Paris) where he sat and sewed visitors garments for them. Other pieces in this vein included the Italian artist Maria Lai (1919 – 2013) whose works included fiddly but rather charming bits and pieces and the utterly solid and intelligent and thankfully cool and calm works from his 1980’s series Wallformation by Franz Erhard Walther (78). Rightly awarded the Golden Lion for best artist. The bizarre whackist performance piece by Mariechen Danz was represented by a video within the space where it had taken place…a throw it all in work with much nonsensical tosh, by and about the artist, to absorb if you wished. At least its absurdist solemnity gave one a laugh, much needed if you had just made your way through the Pavilion of Shamans into the Dionysian Pavilion, the two most awful of the nine that made up the curated section. Out beyond the long run of the Arsenale one of the very best (if not the best) national pavilion was that of New Zealand. I’ve not previously come across Lisa Reihana’s work, though it has been widely exhibited over recent years. But her In Pursuit Of Venus (Infected) work that forms the centrepiece of her show Emissaries is simply stunning, both conceptually and visually. It is impossible to do it justice in description but suffice to say it combines idea and execution with the very best use of new technologies to make something truly spellbinding. If Whackism is in full flow then there was across the city an even more prominent display of Thwackism…the kind of absurdist work that is truly overblown and even more hideously vulgar. Leading from the front – naturally – was our very own Damien with his revolting and trashy Wreck of the Unbelievable schtick. Of course Venice loves this kind of thing…just take a peak in the Venice Pavilion in the middle of the back lot. Whether the old ‘epater le bourgeoisie’ routine can work when the whole edifice is an hermetically sealed game between obscenely wealthy artists and their even more disgustingly rich pals who can say. Perhaps we have to accept that poetry plays no part in contemporary practice but what is certain is that the lad Hirst has wrung every last drop out of it in his Disney meets Ray Harryhausen (on an off day) extravaganza. 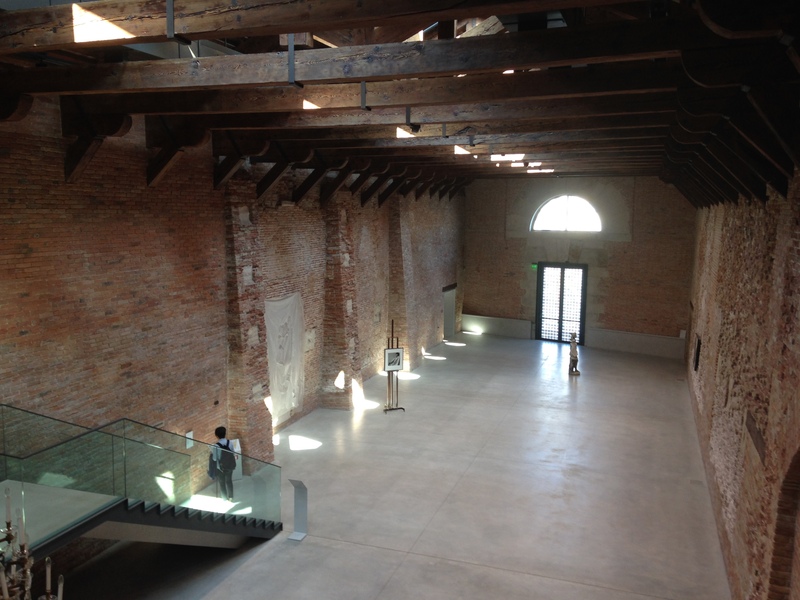 This kind of thing is just made for its two venues – Punta Della Dogana & Palazzo Grassi – owned by Francois Pinault (worth around 13 billion so Mr. Google reckons) making the two sites and their current contents the most vomit inducing sweetie jar in the contemporary art world – quite a feat. And it seemed that Damien had acted as a magnet for Thwackists of every nation…as represented by the odd displays at Palazzo Bembo and on the top floor of Coin, the city’s luxury Department store (admittedly neither of these officially sanctioned Biennale events). By this point those shoes were well and truly beginning to pinch. But thats what makes a few days at the Biennale fascinating…every aspect of contemporary practice is present, often jostling for attention when it doesn’t merit that much and quite often getting it whether or not deserved. Every so often as you whizz by work that might or might not reward given more attention you suddenly see something that catches your eye and even more occasionally engages your brain. Just to list two more that took my attention – Julian Charrière and Thu Van Tran in the Arsenale. And both still under 40…so maybe the future is brighter after all. We were out and about again earlier this week on the ‘Playground of the Midlands’ project – I’m just ordering the canvases to get the paintings underway soon. But looking at the landscape as the first buds of spring got me thinking about the way in which creative activity is beginning to turn as more and more of us are, thankfully, living a good deal longer and the opportunity has been given to those of us of the post war generation through good pension provisions at a younger age to carry on making work into old age. It has come to the fore with the news that Phyllida Barlow will represent the UK at the Venice Biennale next summer – and how good it is to have the pavilion given over to an artist over 70 who is enjoying a substantial ‘late flowering’ in reputation. She’s not the only one who, having had some initial success as a youngster, rather faded from view over the years when earning a living through other work, but has come storming back of late. I’m a great admirer of Sam Gilliam, who I knew from magazine illustrations as a student but who then seemed to disappear (at least here in the UK) until I was surprised a couple years back at Tate Liverpool to see an early work of his in the flesh for the first time. This was followed shortly after when he featured in a room of colourfield painters at the Met in NYC on a visit there. And just now here’s a feature in Hyperallergic…good to see Sam looking very sprightly in his ninth decade! Of course there are many others…Carmen Herrera immediately comes to mind…so as I approach my ‘old age’ – I’m a pensioner in a few months – there’s plenty of good reason to be cheerful and to get in the studio as often as possible! We’ve been gadding about again. Only four or so weeks after the summer trip to Italy we just got back from around 66 hours in Venice. Not nearly enough one might think but you can pack quite a bit into that time if you use it well. The central focus was supposed to be the Biennale but as I get older my desire to ‘do’ these big set piece events in their entirety is waining. So this time we decided to go into the city itself on the Saturday. Interspersing visits to ancillary shows with a mini ‘giro d’ombre’ and as a consequence traversing the byways of parts of Dorsoduro, San Marco and San Polo. It proved to be one of the best days I’ve ever spent in the city in all my visits to the Biennale (and we are wondering now why we’ve never just gone to Venice for itself, rather than always the art event). 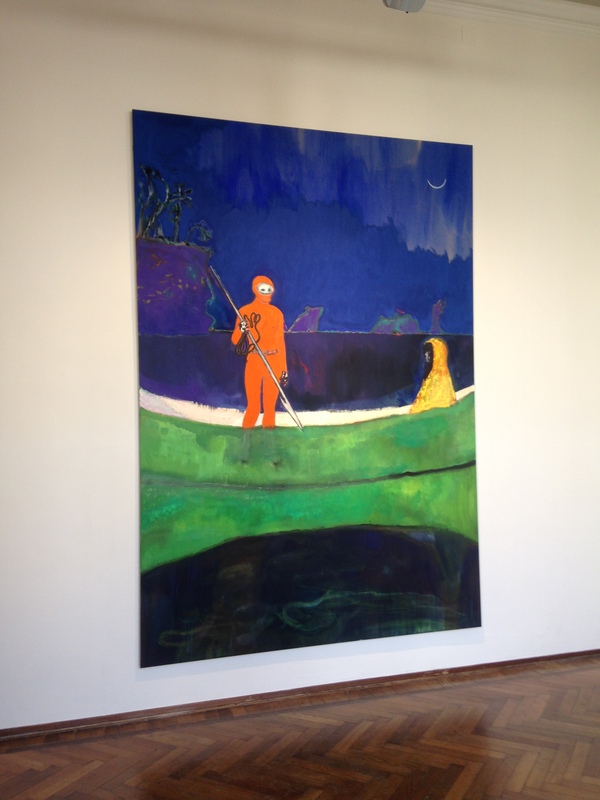 We did see some very interesting contemporary work…and a fair bit of it painting. 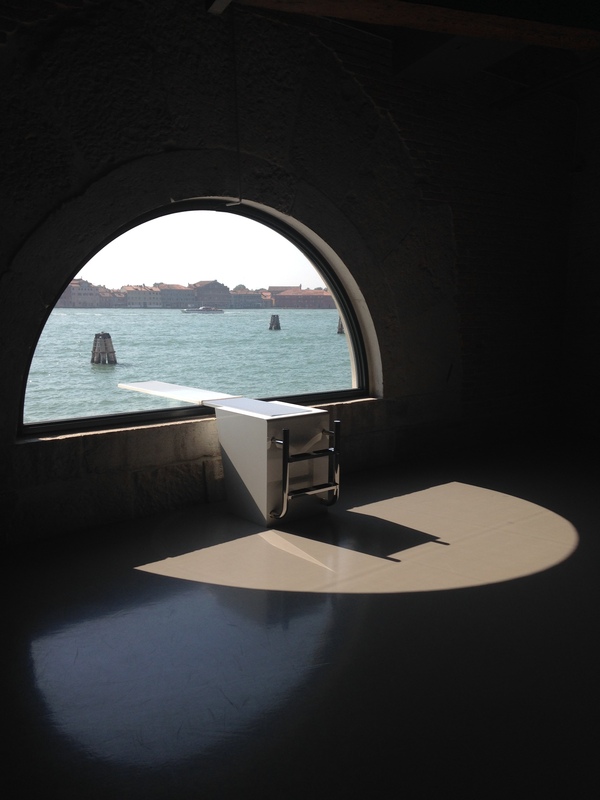 But first it was into the Punta Della Dogana for Danh Vo’s Slip Of The Tongue. What a space! It just shows what virtually unlimited resources can lead to. The show was quite a stylish affair, with a really light touch across the rooms that make up this extraordinary space. Danh Vo’s work is dotted around with contributions from a range of the great and the good of the current scene with several younger figures I was less familiar with. Work by Hubert Duprat and Henrik Olesen caught my eye. Duprat is best known now for bejewelled bugs but I especially liked the pieces Volus and Tribulum that spoke a taut, sparce, simpler sculptural language. Olesen’s diverse output included stuff I couldn’t get on with like his Portrait Of My Mother, two pieces of used pine timber, but his Companion Species eschewed super cool for a more intense negotiation between digital and material engagement and images with content that allows interpretation. Perhaps the strongest, and in some ways the simplest, work on offer, that subtly critiqued the whole shebang, was Elmgreen & Dragset’s Powerless Structure Fig. 13 – it suggested that the outside was much the more important than the interior despite the cultural power contained within. Not only that but it was so exquisitely fabricated and installed. So a show that delighted and in places infuriated pretty much in equal measure. Onwards we went, pausing only to admire the interior, and especially the floor, of the Basilica di Santa Maria della Salute towards the Peter Doig exhibition at the Palazzetto Tito. 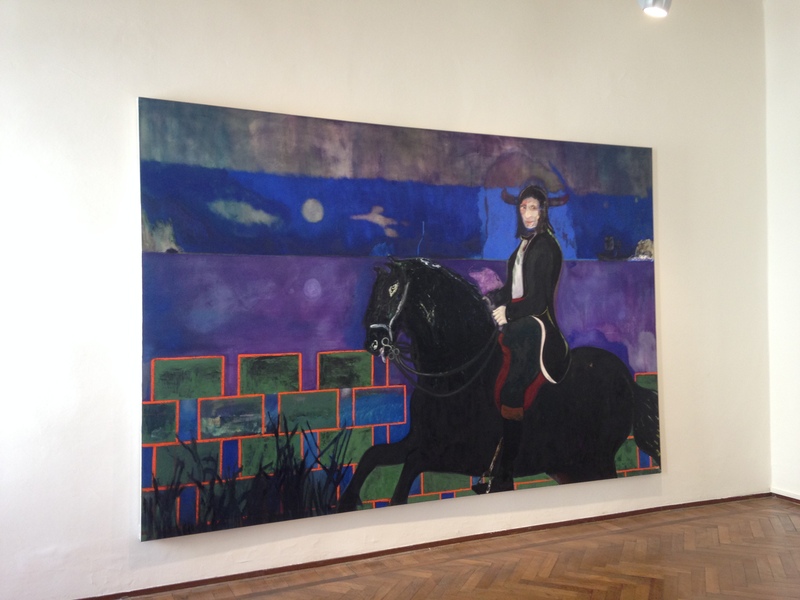 Nothing to do with the official biennale of course and a cynic might say not surprising given the sumptuousness of these paintings that positively delight in the act and the metier of the medium. And the imagery is even more expansive than before…including overt reference to the city of Venice itself. But its the fierceness of the painterly intelligence at work that really steals the show. There is economy, but never less than necessary to get the job properly done. Then there is the bravado of the obvious (especially in some of the colour combinations) but done with such panache and offset by equally surprising and complex choices that they just make you smile. Its a show on a scale and in a space that feels absolutely right. A top job that says painting is alive and kicking in amongst all the multi media and the ‘stuff’. 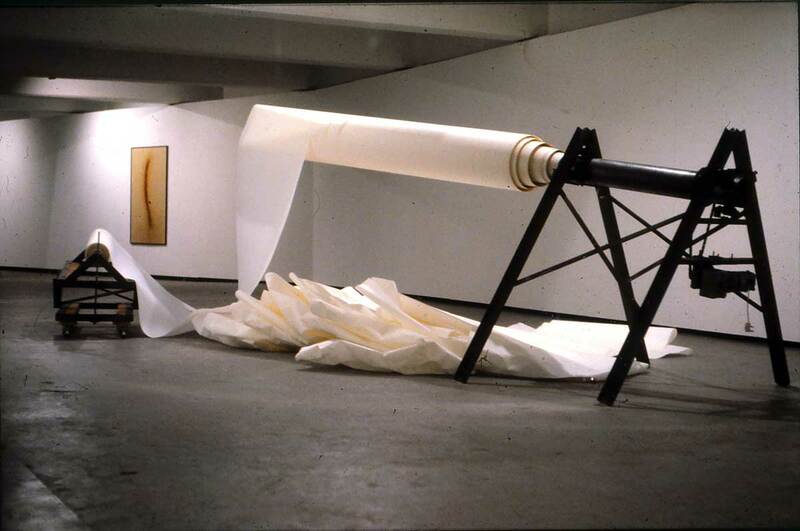 Paul mails me from Australia to say “have you got a picture of Ron Haselden‘s paper roll machine from his exhibition at the Ikon Gallery in the late 70’s” and of course I have! In fact I’ve four of these…though sadly I’ve none of the drawings that accompanied it – and that were rather beautiful. 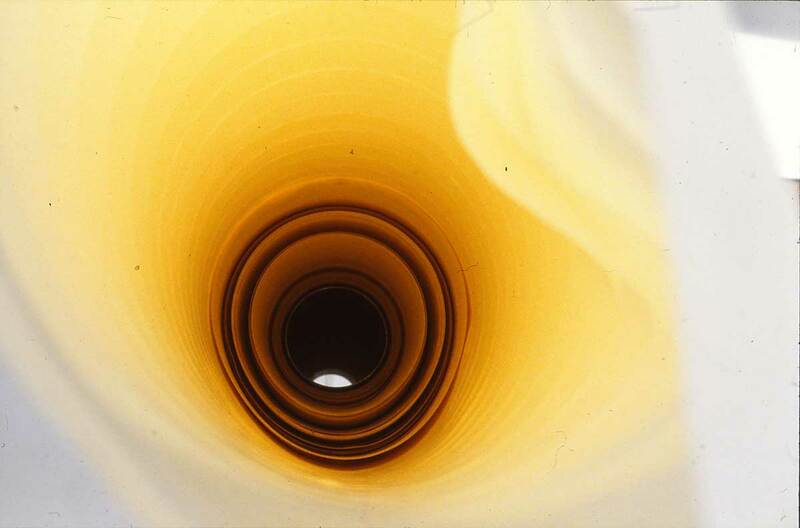 Ron’s idea – like many good ones – was rather simple…could he make a machine that would make a paper cone (similar to something you might roll by hand) and how far might the scaled up roll project? Of course scaling up isn’t so easy – it’s the paper thickness thats the problem. We used newsprint first and that just didn’t cut the mustard. A heavier cartridge worked better…but still not that well though we had the excitement of the moment of collapse as it faltered and toppled. So then the idea was arrived at to coat the paper as it rolled out with a varnish… In all honesty the enterprise was rather a noble failure (it did project but never in the way you can make a small cone do so in your hand – you can see there was quite a bit of spare gallery space going!). But it was great fun and the image shot down the roll is – to my mind – exceptionally beautiful. Ron now lives and works in France…and mostly seems to show there. 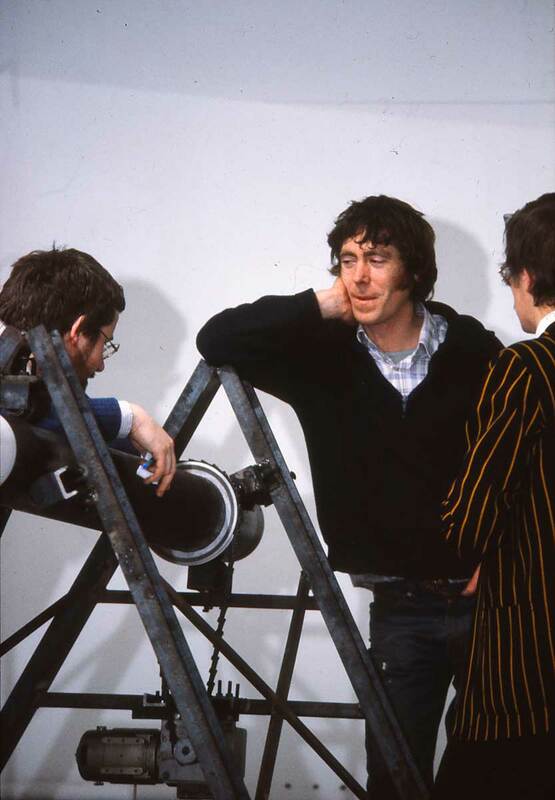 He’s one of our unsung heroes of UK contemporary art in my view…much more worthy of a major celebration at Tate than some of the YBA’s or the latest ‘sensation’ from abroad culled in a lazy stroll around the Venice Biennale or some such! 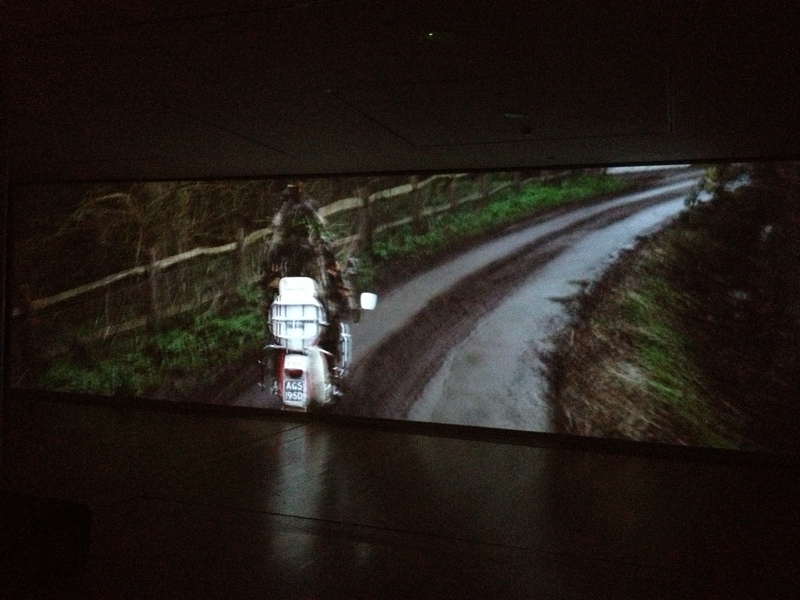 My favourite was this piece – Jack in the Green (Lambretta-AGS 195 to Triumph-GVL2MXD). In this work he combined his long term passion for motorbikes with local legend and celebration and a nod towards the Mods & Rockers confrontations in the 60’s along the south coast all shot on location in Winchelsea, just along the coast from Bexhill. In places it powerfully reminded me of his piece in the Australian Pavilion at the 2009 Venice Biennale…which it you haven’t seen it I urge you to!